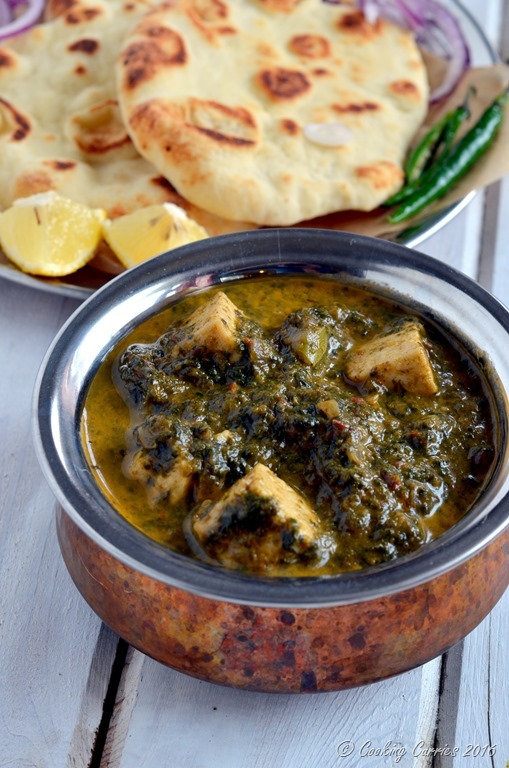 Palak Paneer – one of the quintessential Indian curries with soft Indian cheese, Paneer swimming in mildly spiced sauce made with spinach as a base. Gluten Free and Vegetarian. Ok. So, its one of those Mondays where I haven’t yet gotten over the weekend yet and I am pretty depressed about it. Well, isn’t that the case with every Mondays?! Not really. Most Mondays I am glad it is the start of the new week and I am excited to plan for the week – blogging, meal plans and other things. Today I had so much backlog of work from the weekend that I couldn’t get to the fun part soon enough. I was too worried whether I will be able to get everything done and that is how I woke up, worrying. See, not a great start. 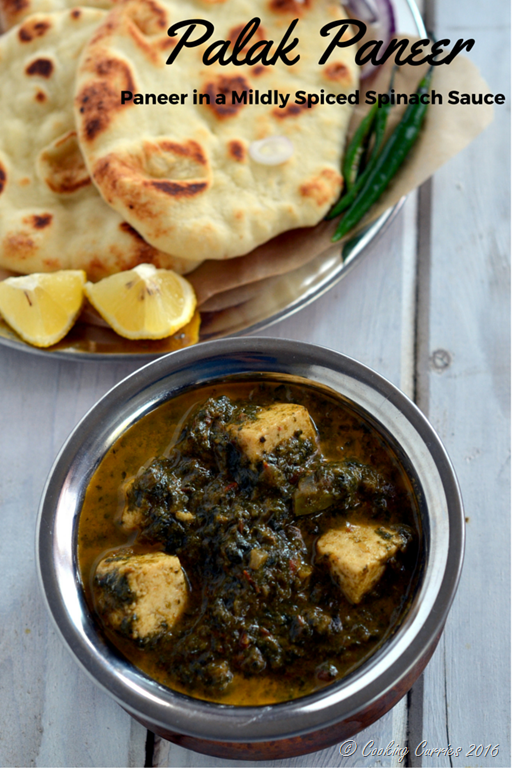 But here is making the most of a Monday and bringing you a delicious paneer recipe that is very mildly spiced. The spinach in it is part of the sauce that you will not realize you are eating greens while you mop up the curry with some rotis or naan. This is a vegetarian and gluten free recipe in itself and you can always devour it with rice instead of any of the breads! The green sauce is a fragrant blend of dried fenugreek leaves / methi mixed in to the spinach to give a wonderful depth of flavors. 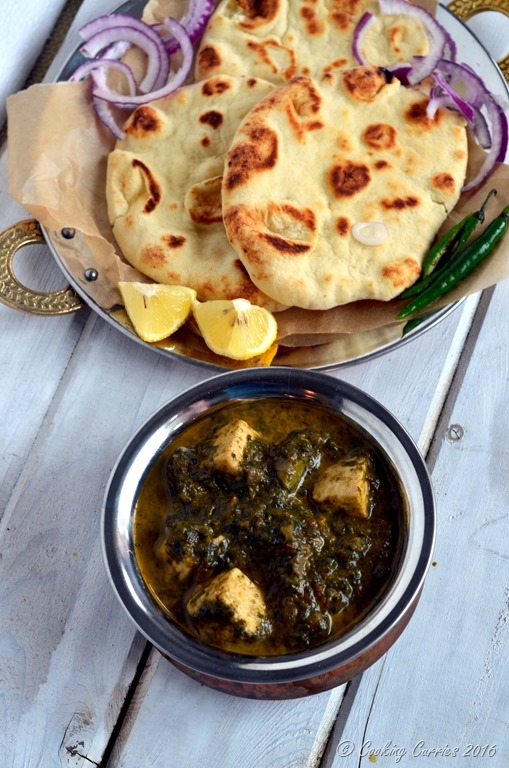 This can easily be made over the weekend for you meatless Monday dinner, as it is one of those dishes that definitely tastes a lot better the next day with the paneer absorbing more flavors of the sauce. Bring 7-8 cups of water to boil and add the spinach leaves to it. Once it softens, take them out in a colander and keep under running cold water. In a heavy bottomed pan / kadhai, heat the oil over medium high heat and add the cumin and fennel seeds to it. Once they start to release their fragrance and turn light brown, add the chopped onions, garlic and ginger to it. Saute well till the onions softens and turns color to a darker brown, but not caramelised yet. Add the chopped tomatoes, red chilli powder, coriander powder and garam masala. Let the tomatoes soften and come together into a sauce. Grind the spinach in a food processor until almost smooth. Add the spinach to the kadhai along with the tomatoes, onions and spices. Add the green chillies and kasuri methi too and let it all cook together for a couple of minutes. Now throw in the paneer and add the salt as well and mix well. Remove from heat and add the cream. Mix just before serving. Serve hot with naan or rotis. 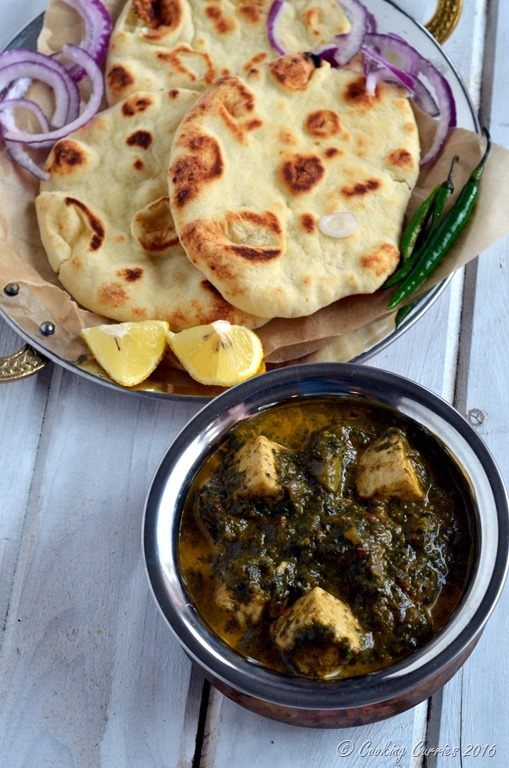 I LOVE paneer! I always have this at Indian restaurants – thanks for making it so I can have it at home too! I am so so so intrigued by this!!! I feel like I’m way too chicken to make this (blame it on my Midwest roots). But you’ve made it look totally do-able. Deep breath – I’m gonna be brave and try!! Yay, Chrissa! Go for it, girl! Let me know if it turned out to be do-able! ?